This symbol-rich liturgy features candlelit readings, psalms and canticles, the renewal of Baptismal Vows, the first Eucharist of Easter, and festive music. Light refreshments will follow. The Rev. Terri Ann Grotzinger preaches. 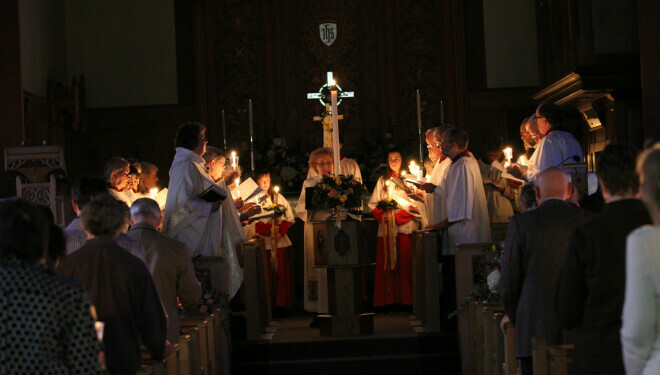 Easter Vigil will come Saturday evening with the lighting of the Paschal Candle from a kindled fire in the courtyard and the entry into the darkened church. This is a night full of symbolism, the singing of the Exsultet, listening to the readings of salvation history, celebrating Baptism in the glow of candlelight, the singing of joyous hymns and anthems, and the celebration of hope rising from despair, the Resurrection in all its joy! Since it was the custom of the early Church to give the newly baptized milk and honey as a taste of the promised land, we conclude our Vigil with ice cream sundaes, a light buffet and a very Anglican spot of sherry! You are invited to bring a bell to celebrate the Resurrection at the Easter Vigil service and at both Easter Sunday services.